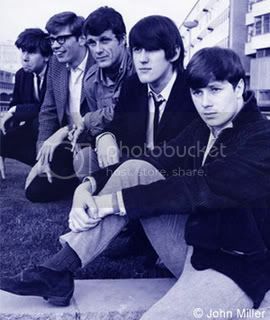 The five group members seen in the photograph may have had the unique distinction of being the only West Midlands band to support THE CREAM at the original “Marquee” club in London late in 1966. Queues had started from 4 p.m. to see Eric Clapton, Ginger Baker, and Jack Bruce’s Cream which had formed in July 1966. Playing to a packed house, the atmosphere was electric. The significance of that night dawned on the members of Catch 22 in later years as Cream became legendary. Catch 22 had evolved from its early origins as The Rocking Renowns 1961 to 63. The founder members were vocalist/harmonica player Roger Guise (Yardley), lead guitarist Vernon Clarke (Yardley), drummer Terry ? (Yardley), and bass guitarist Alan Fitzer (Sparkhill). 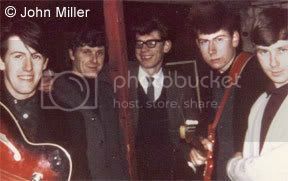 John Miller (Erdington) joined in late 1963 from “Johnny West and The Sunsets” after they had disbanded after two years. The group continued with their music which was a mixture of popular hits and R&B and worked most of the West Midlands venues. They also shared venues with many of the local bands mentioned in Laurie Hornsby’s “Brum Rocks” books. The music became more “blues” influenced as Alan Fitzer had a fantastic record collection and the group built up a repertoire of songs. It was at this stage that Vernon Clarke left the group amicably siteing musical differences. Undeterred, the group expanded their personnel by taking on a young lead guitarist Brian Dufficy (Sparkhill) who was “blues” orientated. Tony Brown (Erdington) took over on bass guitar and Alan Fitzer changed to keyboards. Says John Miller; “This really gave us a broader and authentic sound. I also believe that Roger Guise had one of the best blues voices around and was a major part of our blues success”. The group renamed themselves as “The Renowns Blues Band”. As a blues band they went further afield. London, Manchester, Nottingham, and Leicester, playing Universities, town halls including Birmingham’s Town Hall All-nighter. They were also one of a number of support groups to Graham Bond’s “Shotgun Express” which included Julie Driscoll and Alex Harvey as well as an up-and-coming Rod Stewart! At the beginning of 1966, the band changed the name to Catch 22 with a small 1/2 added. It seemed a good move. After one of John Miller’s comical letters to an agent they were offered an audition to support a major group. The audition was in London and 50 groups took part with each playing three numbers. Some weeks later a contract to support CREAM came through. It was a terrific coup and the band were elated; “Ginger Baker was my drummer hero” says John Miller. “We had some press in the Birmingham music paper with some photographs”. After the Cream support event and in early 1967, an agency saw Catch 22 and offered the group contracts in Germany and Forces bases in Europe over 12 months. IT WAS DECISION TIME. Two members declined. The decision was finally made for them one winter’s night at 4 am. Having dropped off three members and almost home, the commercial van driven by John Miller hit black ice and ploughed into a concrete lamp post. John was thrown out and had severe concussion that left him with vertigo attacks for some years. Tony Brown had cuts to his head and face. The van was a write off. Says John; “We never played again together although we kept in touch. The memory makes me sad as we were possibly on the verge of major success after all that hard work and it ended so swiftly”. and to John Miller for this exclusive story of Catch 22. Good to see that you are helping to preserve the history of the 60s music.IT was a unique period which can never be repeated.It was a social and musical revolution ,a wonderful experience.